Several years ago, someone interviewed the contemporary artist Marc Chagall for a PBS program. The young, arty interviewer started the session with a question about influences. His question was very long and involved and exhibited his own learning along the way, giving everybody, including Chagall, a lecture on the nature of influences on the artist. When the young man finally gave the artist a chance to answer for himself, Chagall said, in the simplest way possible, that his greatest influence was his mother. It took the poor young man a bit of time to get his bearings after that. I know of no more permanent imprint on a life than the one made by mothers. I guess that’s why Mother’s Day always leaves me a little nostalgic. Not simply because my mother has gone on (and heaven’s probably cleaner because of it! ), but because that’s the one day the real heroines of our world get the credit they deserve. Hats off to every one of you! More than any statesman or teacher, more than any minister or physician, more than any film star, athlete, business person, author, scientist, civic leader, entertainer, or military hero . . . you are the most influential person in your child’s life. It’s still worth it. There never would have been an Isaac without a Sarah, a Moses without a Jochebed, a Samuel without a Hannah, a John without an Elizabeth, a Timothy without a Eunice, or a John Mark without a Mary. These men were the men they were, in great part, because of the mothers they had. The hidden secret of that winning combination? Mother with child—just that simple. So, please . . . please, stay at it! A mother’s influence is so great that we model it even when we don’t realize it, and we return to it—often to the surprise of others. As I think of my own mother’s influence on me, two words come to mind: class and zest. My mother, being a classy lady, was determined to keep our family from being ignorant of the arts or lacking in social graces. I have her to thank for my love of artistic beauty, fine music, which fork to use, and no gravy on my tie. She also possessed such a zest for life. I am indebted to her for my enthusiasm and relentless drive. Her indomitable spirit got passed on, thank goodness. And so, mothers, don’t ever forget the permanence of your imprint. The kids may seem ungrateful, they may act irresponsible, and they may even ignore your reminders and forget your advice these days. But believe this: they cannot erase your influence. Posted with permission of Insight for Living Ministries. Adapted from Charles R. Swindoll, “The Greatest Influence,” in The Finishing Touch: Becoming God’s Masterpiece (Dallas: Word, 1994), 234-35. 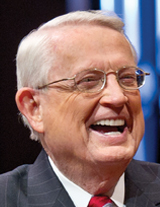 Copyright © 1994 by Charles R. Swindoll, Inc. All rights reserved worldwide. Used by permission.